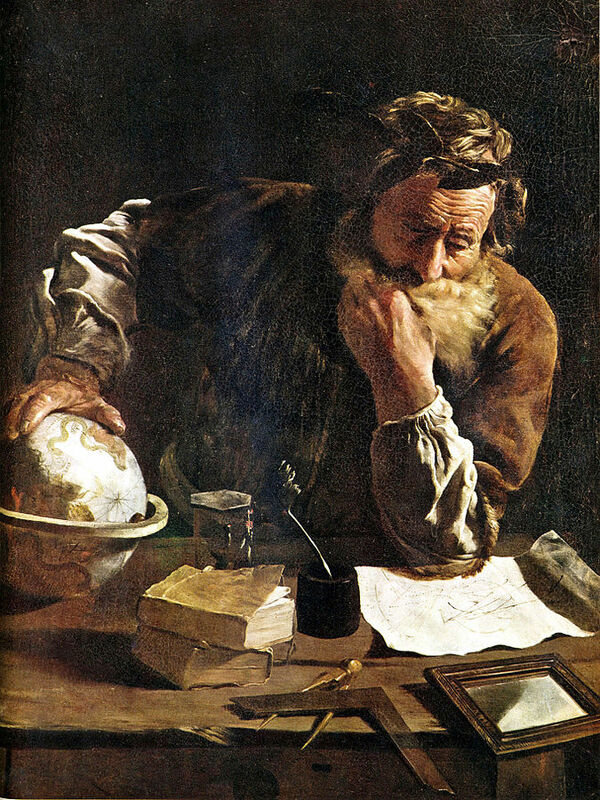 Archimedes Thoughtful an oil painting by Domenico Fetti made in 1620. Consider some laboratory measurements of $E$, the mechanical energy. This page reviews some terms often used to compare observations with theory. Let the experiment be accomplished by any combination of observation and inference whatsoever provided only that it satisfies the professional standards of experimental physicists. For example this means that instruments are painstakingly calibrated. And any new measurement techniques are carefully compared with previous methods so that any systematic variations can be evaluated. Ideally experiments are repeated and confirmed by different scientists in other laboratories. So overall; measurement is a communal activity, with ancient roots, that links specific laboratory practice to the reproducible report of some number. The twentieth century has left us with an outstanding legacy of data about nuclear particles that come from measurements like this. Some amazing displays of international teamwork give reports with more than half a dozen significant figures ! Archimedes is supposed to have implored, 'give me a place to stand on, and I will move the Earth'. Experimental physicists have provided some very firm ground, and WikiMechanics is built on their work. So we expect young scientists to move mountains. expressed on a logarithmic scale in units of decibels .